Today’s world is fast-paced and demands a lot of the modern woman. There is still just 24 hours in a day to complete all your tasks as a career woman, a mother, a daughter, a sister, a friend, a wife and/or a girlfriend. Sometimes you cannot help but feel that time is just flying and passing you by, and before you know it all the stress and problems and anxiety has slowly made its way to your face, in the form of lines, wrinkles, age spots, discoloration and other things that were not there before, about ten to twenty years ago. 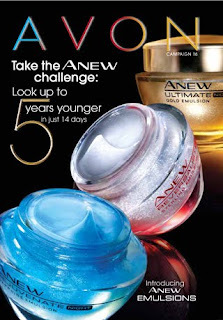 Avon has unveiled its Anew line, with six variants that targets specific anti-aging needs. There is Anew Clinical (any age), Anew Rejuvenate (30+), Anew Reversalist (40+) and Anew Ultimate (50+). Anew Clinical adresses specific skin concerns - Advanced formulations offer at-home options to dermatological procedures; use before your skin care regimen's day or night cream. (results not comparable to professional procedures). Anew Rejuvenate (30+) adresses early signs of aging - Smooths fine lines, brightens dull skin & refines pores; reduces slight undereye puffiness. Anew Reversalist (40+) fights moderate signs of aging - Reduces wrinkles and evens skin tone; decreases dark circles under eyes. Anew Ultimate (50+) defies advanced signs of aging - Reduces deep lines & age spots, restores volume to thinning skin; lessens undereye bags.